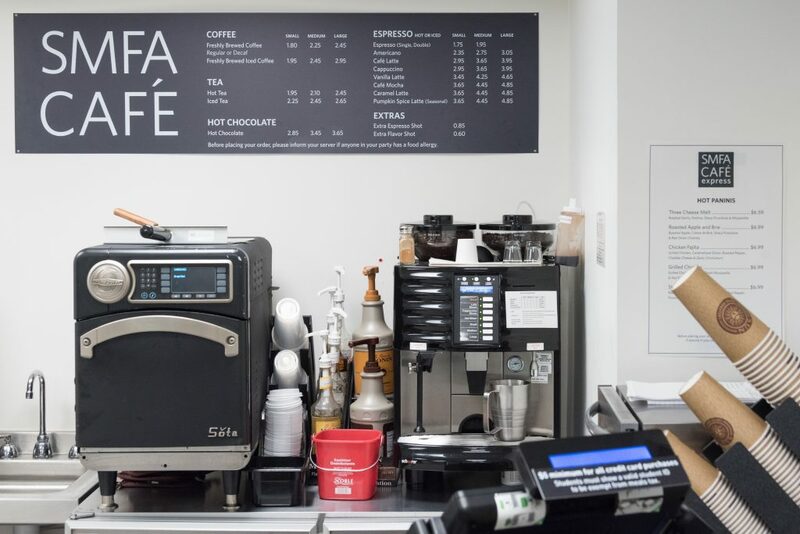 The School of the Museum of Fine Arts (SMFA) at Tufts is expanding dining options with the ongoing development of the SMFA Café Express built last year and plans to expand it into a larger Commons Marketplace-style cafe, which may happen next semester. Nancy Bauer, dean of the SMFA, said that the expansions were necessary to ensure future students’ access to food options on the Fenway campus. She said that not all student and faculty needs can be predicted, but as the school year continues, changes will be made to ensure all needs are met. This includes the request for the expansion of the cafe. “We understand now that the little cafe that we have now is not going to be adequate as our population expands and as the SMFA matures … and so we are now looking over options to make sure that our food service meets everyone’s needs,” Bauer said. According to Director of Dining and Business Services Patti Klos, the original cafe was replaced in an effort to address several Boston building code violations, including insufficient fire protection, smoke management and a lack of sprinklers. During the time in which the new cafe was being built, food carts were available to offer limited service, Klos added. The cafe now offers a variety of grab-and-go items supplied from the Medford/Somerville campus, Klos said. Although the current options are limited relative to dining options on the Medford/Somerville campus, Klos noted that there are plans in place to improve and expand the food options available. While still in the planning phase, changes are beginning to take place. The cafe will be expanded to offer space for a greater array of selections, spilling over into some storage and office space, including the small metals studio, according to Klos. The occupants of the studio have given their approval of the expansion. The school will ensure they have new spaces to work that suit their needs, Klos added. The resulting space will be dedicated to food preparation and display with the atrium providing seating, similar to the Commons Marketplace on the Medford/Somerville campus. With an architect on board and a planning group to determine what students are asking for, both customer needs and economic feasibility are being accounted for in the plans, Klos said. “We’re working hard to build something that will have enough variety food that can be produced as needed … We also know there are people in the community who need to avoid certain things and we need the ability to have enough space to safely prepare foods free of allergens,” Klos said. Bauer said that the SMFA wants to account for when students have class by making sure options are available at these times. “Many classes at the SMFA are six-hour classes with a two-hour break in the middle for lunch. We also have classes that happen in the evenings and we want to make sure [we offer] the best options for everyone for a reasonable price,” she said. Martina Tan, a third-year combined degree student who spends two full days a week on the Fenway campus, noted that the cafe is often closed when she visits the Fenway campus on the weekends. “I have gone there over the weekend a couple times recently and it’s more difficult to get food at those times because the cafe is closed, at least [closes sooner on the weekends],” Tan told the Daily in an electronic message. The cafe currently doesn’t open on the weekends, according to its website. Klos previously told the Daily in a Dec. 6, 2017 article that the university was considering adding weekend hours. Nayoung Kim, a third-year combined degree student who spends three full days a week on the Fenway campus, also said food options are limited, comparing the SMFA Café Express to Mugar Café on the Medford/Somerville campus. Klos said that there is currently a feasibility study in progress to drive dining development. “The university always anticipated it would provide something a little bit more robust than the abbreviated service we have now so we’re in the midst of a feasibility study determining what would best meet the needs of this school for the foreseeable [future],” Klos said. Part of the study focuses on determining which food options are most desirable to students. Klos said that community input will guide what is on the resulting menu.